Rarely do I find well used tools at an estate sale where the fastest and best picker guys dig and lift and elbow and haul away some truly great stuff. By the time I had gone through the house and paid for the first run through I was ready for the garage. I filled a bag with rusty and very well used files (I love files). 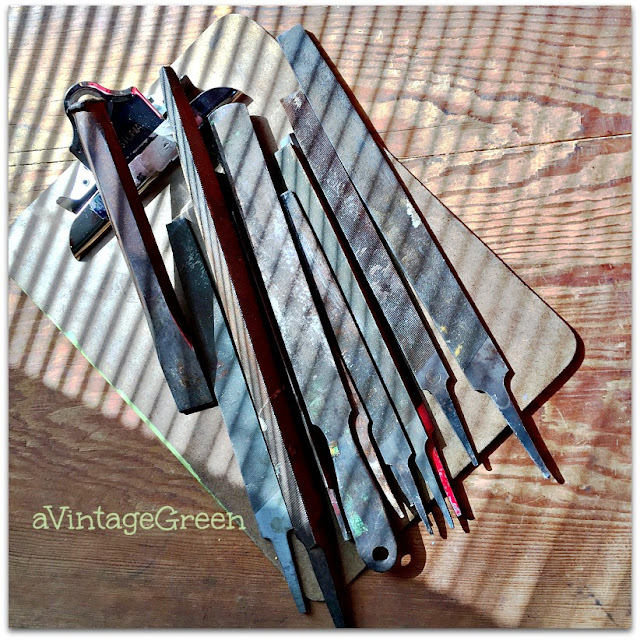 Files (and chisel) in the sunshine and yes grateful for sunshine when I took this photo this week. I ended up with bags and boxes of small stuff (the big stuff was already claimed by the faster, stronger guys) but since I really like rusty, dirty, cast iron and metal shop tools I was happy. The P.R. 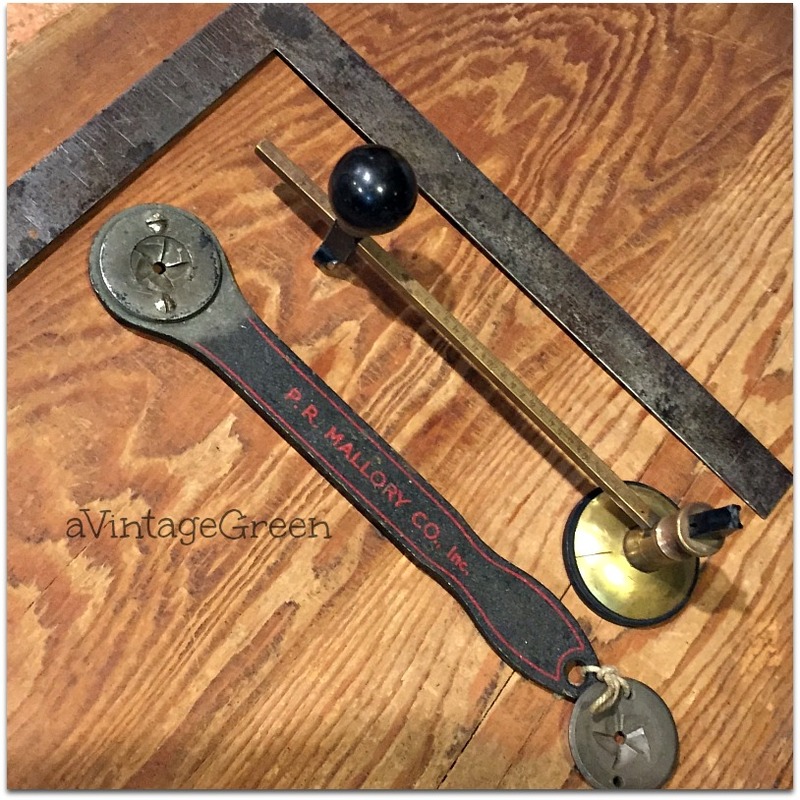 Mallory Co. Inc is a Rachet Battery Tungsten Wire Lamp Filament Tool who knew! ), a brass circle scribing tool and an L rules 12 " and 6 ". Digging through boxes, shelves, tins, jars and drawers and under and over etc. is part of the fun. Tin Snips, 8" chisel, clamp, file and ... Antique Cast Iron Gear Pullers with 2 legs. 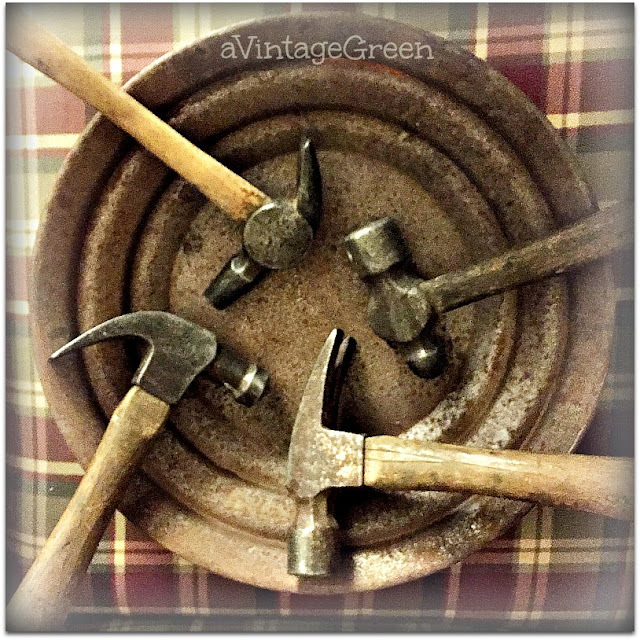 Hammers - what can I say - these were all old, the wood plugs weren't keeping the steel heads tight and the shape of the hammers just made my heart beat faster. Vintage and well used selection of hammers in a rusty and rusted prospectors (I think) pan. The picking and hauling was only part of the job of getting the tools ready to take to my booths. Each piece had to be identified and cleaned. I used Hemp Oil (MMS) on a soft old piece of flannel to oil and then clean and polish each piece of metal. Then I took my pictures, copied the descriptions into this post and finally wrote the descriptions onto baggage tags, tied to each individual tool with hemp string and boxed the tools to go to my booths. Whew - and not all in yet either. I needed to make a change on a routed PEACE sign. Brown wasn't working. I painted the top and sides ASCP White and then used FAT Paint 'Juno' (pink). It was easier to have the routed letters painted white and then add colour on the surface. 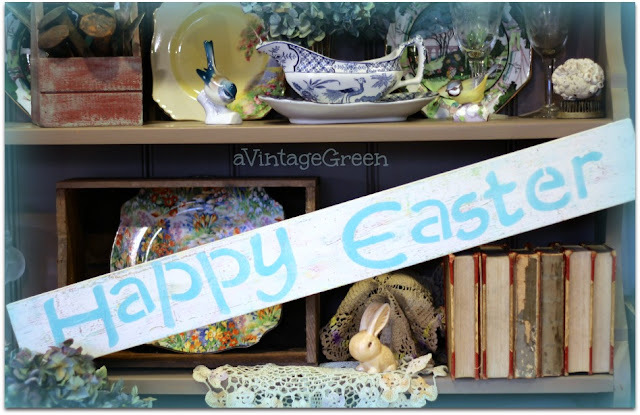 I suspect that a touch of Easter decorating just crept in to this post although the hen has not yet laid the eggs for the Easter Bunny and Friends to decorate. Natural shadows certainly change the look of the PEACE sign. I did keep two hammers, 2 saws, an electric small hand sander, the brass scribing tool, an 18" metal ruler, a hardly used long file, a small drywall saw and extra blades and a folding tree saw for our own workshop. I put the Peace sign in my booths - it went so well with the small pink and white baby quilt. Such great finds! I love old tools, too. 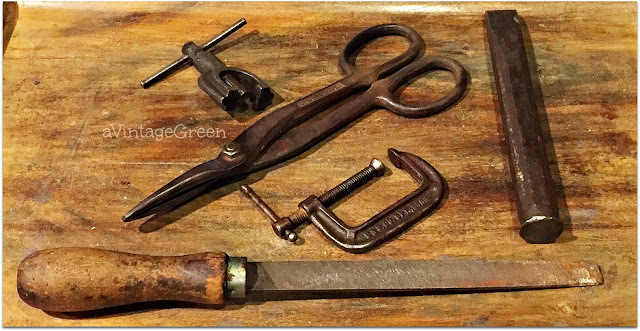 Louis Dean still has some of his father in law's tools and they are extra precious. I so wish I could pop in and see you in your shop! Great tools! I've found a few in my wanderings but don't buy them a lot. 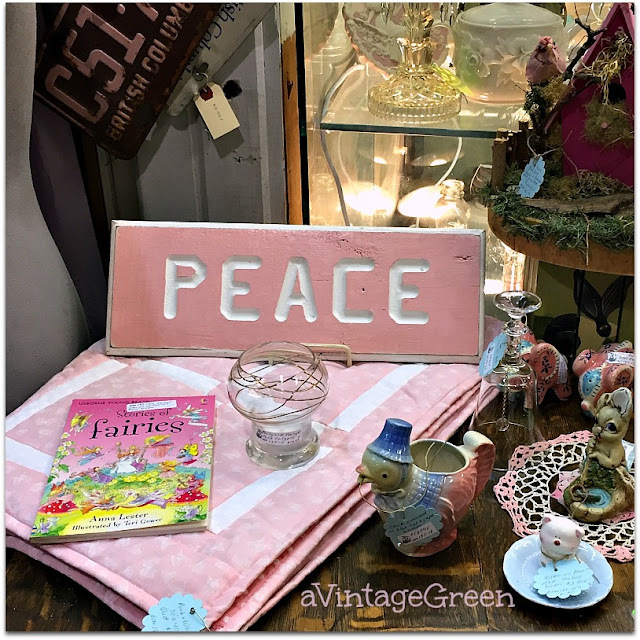 Love the remade Peace sign...Pink is my color and it does go well with the baby quilt. Wishing you a lovely day! Some great finds. These remind me of some of my Dad's old tools that I still keep to this day. If I open the toolbox I can still smell the way his garage always smelled. Brings a warm feeling. Thank you for sharing with us. My dad gave me one of his old metal toolboxes filled with some of his tools. I know exactly what you mean. It's a prized possession of mine. The 2 top small hammers in that picture of 4 hammers look like jewelry or metal working hammers. I use hammers just like those when I pound jewelry. Those are 2 nice finds. I love that little cream pitcher...with the blue hat! Just adorable! And the roosters...oh and those neat old hammers. What fun you had! Hugs! It's a good thing we don't all go for the same treasures, isn't it! The tools are great mantiques in a booth...my stuff is all so feminine I feel guilty some times! I'm sure the ones you sell will find good homes! I love the renovated Peace Sign! What super finds, you sound so happy describing your old and battered treasures that I could just picture you rifling through those boxes and bags to find them. 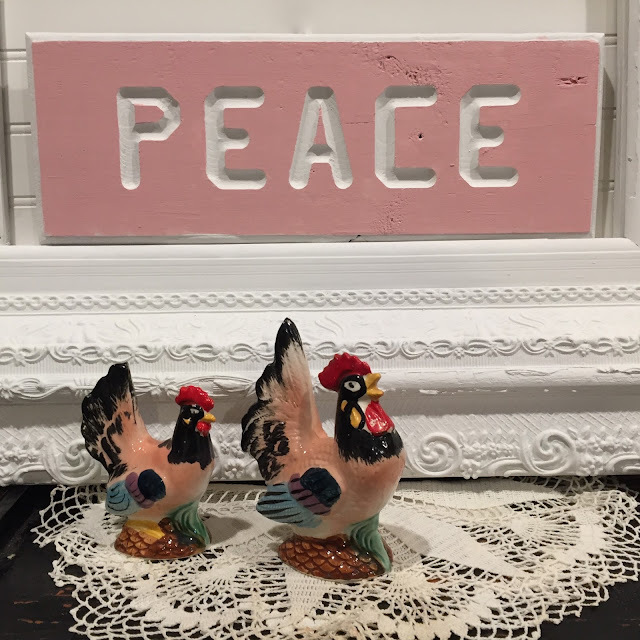 The sign looks so much better in pink and white and is perfect for the new vignette in your booth. Hope your week ahead is filled with even more great finds. Wow Joy, what beautiful finds. All that rusty goodness in one Estate sale haul. Those tin snips made my heart go all mushy. I have noted your many references to hemp oil and I am looking forward to using it on some of our items that have been in storage for two years - I think it will make a big difference! Joy, This was a great post as usual. Love old hammers and the C clamp. Have a great Easter. Sylvia D.
I love that you kept old school tools for your own handiwork creations, a unique touch of authenticity. Love the refresh on the PEACE sign. Do you like FAT paint? There is a FAT paint booth where I used to have my booth. I used their clear wax, which smelled heavenly, but have yet to commit to the paint. Joy, I love all the old tools you found. I often head to the garage first at estate sales for that very reason. I want to old rusty and crusty. :) Thanks for sharing with SYC. Love seeing all of your finds! Thanks for sharing with us at the To Grandma's house we go link party! Hi Joy, I love all your finds and the signs that you make. It makes me want to have a booth somewhere! Thank you for sharing with us on Party in Your PJs.